A medal awarded to members of the United Textile Workers of America. This medal belonged to Emil Salmi, ca 1940. Donated by the Family of Emil Salmi. 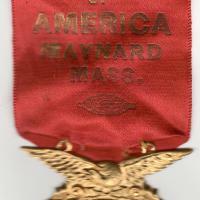 “United Textile Workers of America, Maynard, Mass Medal,” Maynard Historical Society Archives, accessed April 24, 2019, http://collection.maynardhistory.org/items/show/6278.